If you do business internationally – such as, in my case, translating – you soon become aware that the world generally uses two sizes of paper. There are bigger international annoyances than this, such as getting paid across borders, but this petty nuisance deserves some attention. Why do two competing paper sizes even exist? • The most frequently used paper size in the world for business purposes is A4, measuring 210 by 297 millimeters (8.27 in × 11.7 in). It originated in Europe. • Letter, also called US Letter, is the common paper size commercially used in the United States, Canada, Mexico and the Dominican Republic. It measures 8.5 by 11.0 inches (215.9 mm by 279.4 mm). No one knows how Letter size started, but the American Forest & Paper Association believes it goes back to the days of manual paper-making. A paper-maker created a page as long and wide as his arms could reach. The page was later trimmed into quarters, so a page is one-fourth of the span of a man’s arms. Europeans, however, can explain exactly why A4 paper is that size. In the late 1700s, scientists created an ingenious series of sizes of paper. It starts with a meter-square sheet, which is then cut in half with an aspect ratio involving the square root of 2. It has technical advantages for scaling printed material to make it fit a larger or smaller standard-size sheet. This discovery was briefly used in France, then forgotten for more than a century, when Germans reinvented the meter-and-√2 system. What’s interesting is that both A4 and Letter became standards at about the same time. The international zeitgeist was striving for efficiency. Germany adopted the A4 system in 1922. It slowly began to be adopted by other countries, and in 1975 it became an ISO (International Organization for Standardization) standard. The Letter size became an industry standard in the United States in 1921. For a time, the federal government used a slightly smaller size, but it adopted the Letter size during the Reagan administration – there’s something to thank him for. In 1992, the American National Standards Institute defined it as an official standard. Why two standards? Why couldn’t the same standard have been adopted in the early 1920s all over the world? It’s hard for us now to imagine how isolated Europe and North American remained from each other in the 1920s. Airplanes could barely cross the Atlantic Ocean. Radio operators had just begun to talk to each other. Ships took more than a week to cross the ocean in good weather. The two continents didn’t need the same standard. So here we are and here we may stay. Seen from space, the world is a single beautiful blue marble in the heavens. On the ground, we can’t even agree on what size a sheet of paper should be. But we needn’t live alike to love alike. The 20th century faced the challenge of standardization with reasonable success but failed disastrously with the challenge of world peace. The 21st century could make peace a worldwide standard. Translators are standing by to help word by word. This article delves deep into paper size specifications, including where to punch holes for filing purposes and how big the holes should be. Yes, of course, there are rules about that. My friend, we can barely restrain him from blowing up our health care system or North Korea. You ask for too much. 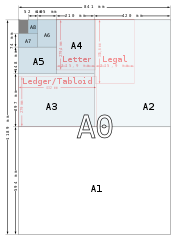 As often happens with Wikipedia, this article explains paper sizes in greater detail than you may ever need to know, although the charts are lovely. And here’s everything to know about the US Letter size. Finally, check out “A4 and Before: Towards a long history of paper sizes,” by Robert Kinross. It is indeed a long history going back to the Middle Ages, although he only explains A4 paper. This 30-page PDF is taken from a lecture given at the National Library of the Netherlands. Cross-posted at my professional writers website.